This cookbook was created out of necessity. I was tired of searching far and wide for ingredients that I would only use once every six months. Who wants to spend all that time and money on complex recipes you will never even cook? That’s what led me to create this cookbook full of step-by-step recipes that are easy to follow and simply prepared. Most importantly, they are healthy and your family will love them. All of the recipes only require 5 ingredients or less! 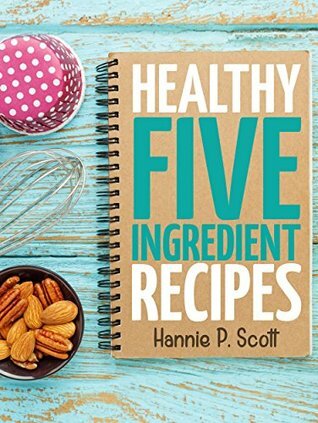 Full-Time Mom, Best-Selling Author, and Lover of Food, Hannie P. Scott is a best-selling author that knows a thing or two about cooking! Cooking and experimenting with foods is her life passion. Driven by her desire for cooking for others (and herself), Hannie spends a lot of time in the kitchen. She enjoys sharing her love of food with the world by creating “no-nonsense” recipe books that anyone can use. 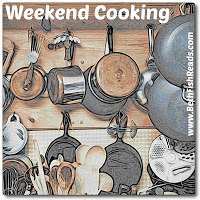 You can find cooking tips, advice, and recipes on her blog. Bring to a boil and then cover and reduce heat and simmer for 20 min. Note: You could also do this in the slow cooker using raw chicken. I have a few of his cookbooks and they are complicated. This cb was the opposite. This is my kind of recipe book. I dislike recipes with tons of ingredients. That white chicken chili sounds really good. Me too, and I like them to be as easy to make as possible. Those two recipes look delicious. Sounds like a good book. My daughter and her family love White Chicken Chili, so I’m eager to try it. I love easy recipes like that. Me too Kathy. I cooked for a lot of people over the last 40 years and now that it’s just me and my son Anthony, the fewer ingredients and steps the better. This looks perfect for weeknight cooking during my really busy season (spring!). I really like white chili (and salsa verde), so I’ll have to give that a try. I love almost anything with chicken and I also love salsa verde. 5 ingredient recipes are so awesome! I cook Indian food most times and they always need so many ingredients. I love Indian food but rarely cook it at home. I like going to Indian restaurants. Can you guess what I’m craving now? You had me at 5 ingredients 🙂 Going to look for this book! Kindle edition is 99 cents – sold! I hope you find some recipes you love! Both of these recipes sound delicious, I’m pinning them. If you decide to make them, I hope you like them. I’ll be posting my reviews soon. These recipes sound really good and I like that they’re not a million ingredients but aren’t full of processed food either. I’ll have to look for this one. If you get it, I hope you like it as much as I do. I think you’d like it Klara!